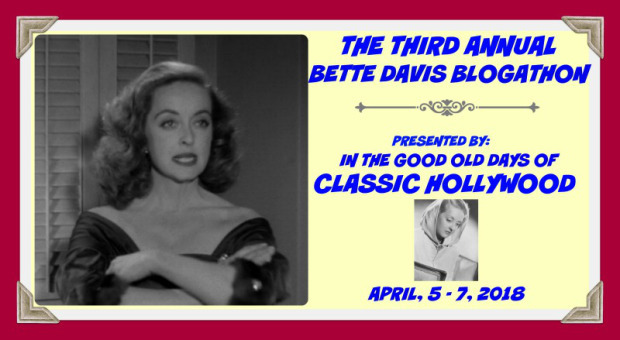 Crystal of In the Good Old Days of Classic Hollywood is hosting The Third Annual Bette Davis Blogathon from April 5th to 7th. Click HERE to join in the fun. Shiloh, the fictional Wyoming ranch setting of Owen Wister's timeless 1902 novel The Virginian has seen many incarnations on stage and screen over the years. The television series ran for 9 seasons (1962-1971) with a unique 90-minute format. The seasons saw many changes to the large cast with each iteration bringing its own tone to the program. Consistent through the years was the quality and the stars James Drury as the admirable title character and Doug McClure as fun-loving ranchhand Trampas. 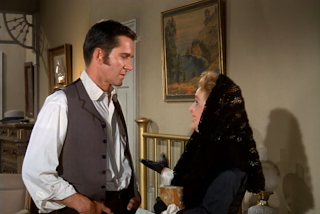 The Virginian and Trampas feature in this episode from the first season guest starring Bette Davis. Joe Darby and Celia Miller robbed at gunpoint. The bank in the town of Rocky Point was robbed of $60,000 and the bank manager shot and killed. Two of the clerks Joe Darby played by Woodrow Parfrey and Celia Miller played by Bette Davis are witnesses to the crime. A year later one of the robbers, Walt Gleason played by Christopher Dark is apprehended on a separate charge but found with money from the robbery. Instead of naming his true partner, Gleason identifies Trampas, top hand at the Shiloh Ranch as his confederate. 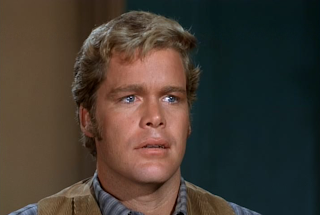 Trampas is apprehended by Rocky Point Sheriff Luke Donaldson played by Gene Evans and taken to face trial. 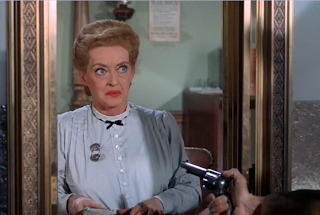 Both Darby and Miss Miller identify Trampas as the robber and the one who shot McGowan. Later when Joe Darby is reminded that he wasn't wearing his needed glasses until a month after the robbery, he recants his testimony. Miss Miller, on the other hand, is a woman who is quite sure of herself. Indeed, she is quite sure of herself even after she knows she is wrong. 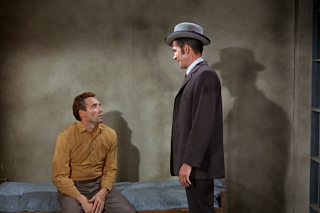 The reason Gleason fingered someone other than his true partner is that he needs that man, Malcolm Brent played by Lin McCarthy, to help him get out of jail. Brent has money to pay men to accomplish the breakout. Yes, Brent has money, but other people know he has money. Miss Miller spent her life in this town and is well known and respected. She spent most of her life supporting and caring for an invalid father. Most people in town agree the father was not an easy man to live with, but they don't realize to what extent. Upon his passing Celia discovered that her father's disability was a lie. He used her and lived off her earnings. "This life gives you nothing" has become Miss Miller's creed, and she has decided it is time for her to do some taking. Brent came to town to help Gleason under the guise of being a newspaper reporter. After observing him, Celia Miller realizes why he looks familiar. Her identification of Trampas had been an honest mistake, but she is willing to let that mistake stand. She demands $10,000 from Brent in exchange for her silence. A letter has been placed with the bank which gives his description to the authorities should anything sudden or untoward happen to her. Brent is stuck with this formidable blackmailer. What can he do but give in? 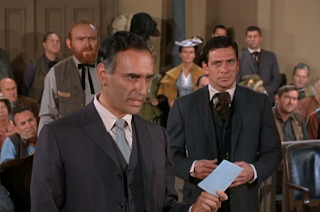 All this time The Virginian, working with Trampas' lawyer Samuel Cole played by Noah Keen, has been investigating. They convinced Joe Darby to change his testimony through the obvious means of his eyesight. Miss Miller is not so easily swayed, but something doesn't seem right about her testimony. 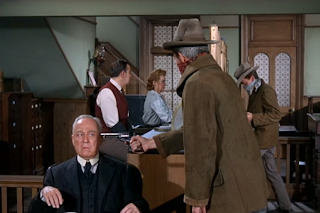 On the night of the jailbreak, Trampas takes the opportunity to leave as well in search of Miss Miller. He wants to talk sense to the woman. As The Virginian expressed it: "Gleason was broken out. Trampas is just stupid!" 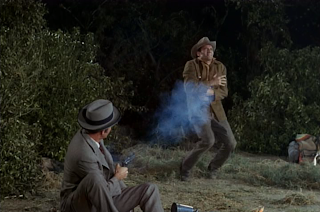 When Trampas realizes his efforts with Miss Miller are in vain, he is recaptured on his way to turn himself back in. Brent left town at the same time as Gleason and the jailbreakers. This looks suspicious to The Virginian who checks into the man's background and discovers he is not a reporter. If not who he said, then who was he and why was he in town?. 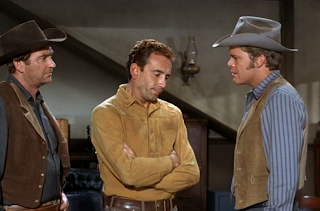 The Virginian and Cole gradually piece the plot together, but they lack proof. Out in the wilderness, Brent and Gleason turn on each other and both men are dead while Miss Miller keeps her secret and her cash, and Trampas ponders a dismal fate in prison. 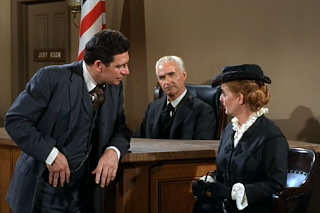 On the witness stand, it is obvious to those in Trampas' corner that Miss Miller is lying, but the Prosecutor Tom Finney played by Harold Gould, is in full Hamilton Burger mode with "incompetent, irrelevant, and immaterial" pouring forth as if from a spout. Proof to The Virginian, if not to the court, is the fancy dress Celia has made, the first of many for her new life as a rich woman. She plans to go to Rome and pass herself off as a wealthy widow. Life will be hers to enjoy at last. The news is leaked that upon the next day the jury will return a verdict of guilty. 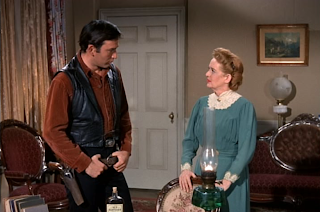 The Virginian brings a bottle whisky as a token of Trampas' defeat and Celia's victory. She chides him for the obvious ploy of trying to get her to loosen her tongue. She belittles the fate awaiting Trampas until The Virginian speaks of a life lived under the sky taken away and replaced with prison walls. It may as well be a death sentence. The pressure has finally gotten to Celia. She drinks her own liquor. She worries over the turn her life has taken and the lie she can no longer live with. Desperation drives her to seek the sheriff and as she runs through the main street of town she is not aware of riders and how close they are. Celia Miller is accidentally killed without completing her act of redemption. The judge is pronouncing a very harsh sentence on Trampas when Sheriff Donaldson arrives with the letter Miss Miller had used as insurance against the real criminal. The Prosecutor makes his recommendation and the Judge sets Trampas free. On the way out of town, Trampas opines that this town has caused them a lot of trouble. Maybe they should rob the bank. The Virginian's response is the character's most famous line from the novel, the play, and all film versions. Trampas: "You'd make a good bank robber." 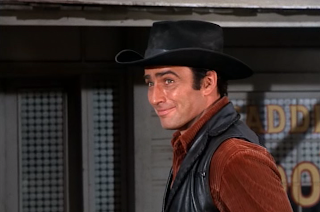 The Virginian: "When you call me that, smile." 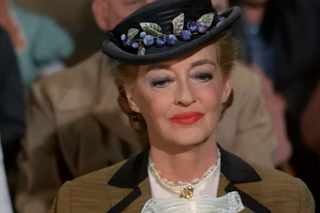 Bonus: a selection of hats and scarfs worn by Bette Davis as Celia Miller. Check out those Bette Davis Eyes! This sounds like a role tailor made for Bette Davis! It certainly played to her strengths. 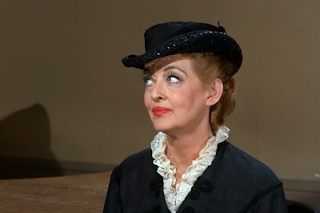 I always enjoyed Miss Davis's TV appearances and this is one of my favourites. I have often wondered if it was written specifically for her! 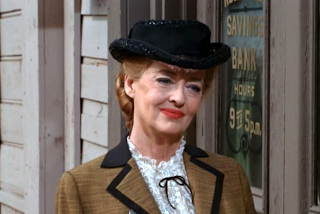 I still believe that if Miss Davis had decided to do a television series in the mid-Sixties, her character from Perry Mason (Constant Doyle) would have made for a good one). I think this must have been written with their guest star in mind. Constant Doyle would have been welcome any time they chose to give that character a series. I am surprised it didn't work out. You have to wonder what those executives were thinking. What an interesting episode! I've heard of this show before, but I haven't been able to seek it out yet. Looks like I may be missing out, though! Especially if it was able to get such a star as Miss Davis. I loved this show growing up. Even more so when I could appreciate some of the guest stars like Ricardo Montalban, Robert Redford, Barry Sullivan, George C. Scott, Diane Baker, Pat O'Brien, Coleen Gray, Janet Leigh, Ann Sothern, Dan Duryea, Ann Baxter and more. Ida Lupino guest starred in two episodes and directed one. I hope you get the opportunity to check it out, and sincerely hope you enjoy what you see. 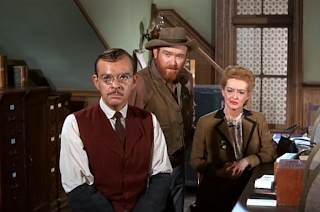 THE VIRGINIAN was a quality show and frequently featured first-rate guest stars. I don't recall this Bette Davis episode, but--as someone else noted--it sounds like a perfect role for her and I'll bet she was excellent. 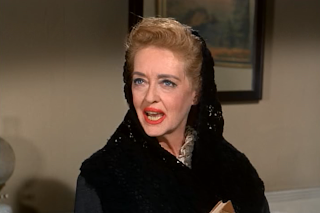 Our Bette played it to the hilt, and the entire episode worked beautifully. Always been a fan of Western TV shows such as The Virginian, The Big Valley and Gunsmoke. 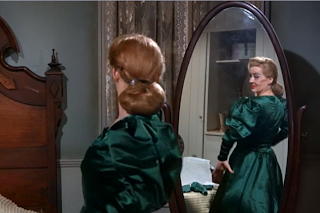 But I didn't realise Bette appeared in one! Look forward to watching this episode. Thanks for the review! Keep your eyes peeled. 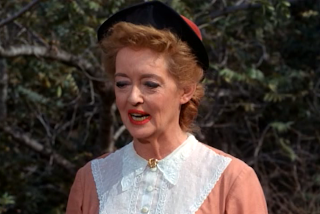 Bette made a very dramatic appearance on Gunsmoke, and guest starred three times on Wagon Train!